The output is an array of subnets with different settings per subnet. 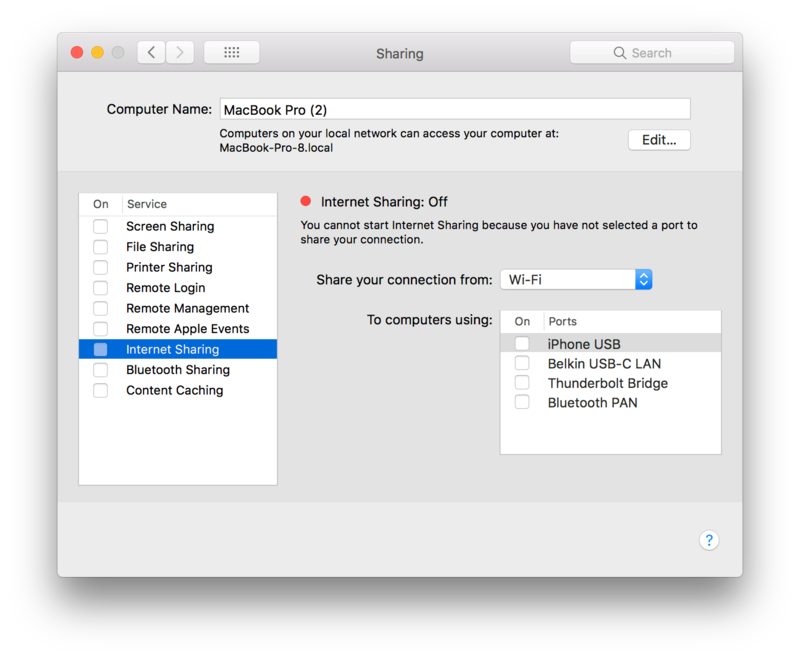 The easy thing is to configure a DHCP server is using Internet Sharing from the Sharing System Preference pane. To do so, simply open System Preferences, click on Sharing and then Internet Sharing. But wait, where do you configure a scope, or the DNS Server or… The answer is “the command line” but don’t be put off by that. In this case I prefer it. Let’s start with a simple example of copying the range from one of these to another. First, locate the net_range_startand the net_range_endkeys in your serveradmin output. Then find the net_range array in your bootp.plist. They’re the same in my two examples because the macOS Server app was just hacking the bootp.plist (OK it was doing more but that was the main thing it was doing). On a fresh new server you might have a very different plist, so you can borrow the above if ya’ need to. Replace the two values in the two strings with those in your server if needed. Next, find the dhcp_routersetting for that subnet and match it to the same in the bootp.plist. Then, the net_mask. These are all that are required for DHCP to work (technically, the router isn’t required, but it’s super-weird on Apple stuff when there’s not a router, so it’s best to have one when possible. If you need WINS, domain names, DNS Servers, etc, simply repeat the process. You can also copy and paste the code block between the <dict> sections if you need multiple subnets. Or you could move the service to a network appliance more capable, if needed. dhcp_enabled – Used to enable dhcp for each network interface. Replace the <false/> immediately below with <array> <string>en0</string> </array>. For additional entries, duplice the string line and enter each from ifconfig that you’d like to use dhcp on. bootp_enabled – This can be left as Disabled or set to an array of the adapters that should be enabled if you wish to use the bootp protocol in addition to dhcp. Note that the server can do both bootp and dhcp simultaneously. allocate – Use the allocate key for each subnet in the Subnets array to enable each subnet once the service is enabled. Subnets – Use this array to create additional scopes or subnets that you will be serving up DHCP for. To do so, copy the entry in the array and paste it immediately below the existing entry. The entry is a dictionary so copy all of the data between and including the <dict> and </dict> immediately after the <array> entry for the subnet itself. name – If there are multiple subnet entries, this should be unique and reference a friendly name for the subnet itself. net_address – The first octets of the subnet followed by a 0. For example, assuming a /24 and 172.16.25 as the first three octets the entry would be 172.16.25.0.
net_range – The first entry should have the first IP in the range and the last should have the last IP in the range. For example, in the following example the addressing is 172.16.25.2 to 172.16.25.253.
dhcp_domain_search – Each domain in the domain search field should be suppled in a string within this array, if one is needed. If not, feel free to delete the key and the array if this isn’t needed. dhcp_router – This entry should contain the router or default gateway used for clients on the subnet, if there is one. If not, you can delete the key and following string entries. Once configured, configure the service to start automatically. To do so, open /System/Library/LaunchDaemons/bootps.plist. Here, just change the Disabled key to False, by changing the word True in line 6 to False. The keys in this file make it easier to script figuring out a few things about your active leases, such as when they’re going to expire, when the lease was accepted or even whether or not the system has a lease (especially when it shouldn’t have a lease). But they can cause misreporting. If the information seems “stuck” in the System Preferences pane you can then rm the dhcp lease file. Note: If the RouterIPAddress cannot be reached, the lease will be delayed in processing, causing the lease to appear to take a long time to be obtained even though it’s looping to hopefully find a more appropriate lease with a RouterIPAddress that can be reached. And that’s it. This whole thing can take 5-10 minutes. In fact, if you were using macOS Server then just backup your bootp.plist and copy it to another machine, assuming the network interface (en0, en1, etc) hasn’t changed. Or change it if it has. But, for all the other weird stuff that was in the UI (or even the stuff that was never in the UI), here’s a pretty lengthy explanation of how to manage all of it from the command line. Building a GUI to configure these wouldn’t be that hard either, assuming you have bootp built into the Mac for awhile (and I think you need it for Internet sharing). Oh, that reminds me, Internet sharing is likely to overwrite any custom settings, so once you hack the plist, don’t go back to System Preferences-based management.